I threatened some time ago that I would start an account of the model railway I always wanted to construct but have never had time to do whilst I have been working and latterly running the Bromsgrove Models business. Well I have started and construction is well under way, but more of that later. A brief background and raison d'etre which hopefully won't bore too much! 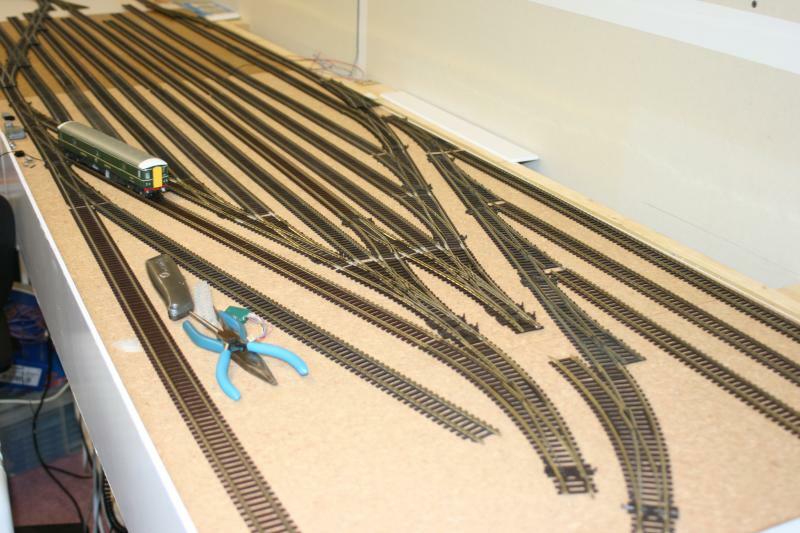 There will be three elements to the layout comprising two stations and a large fiddle yard. The two stations will be called Chelford and Oxsea and the fiddle yard (on a lower level) is Battenham - you may have guessed by now that the layout is not going to be based on any particular prototypical running! Rather the names are a mixture of the places that have have a great impact on me during my lifetime - Cheltenham (where I met my wife), Oxford (where my wife comes from), Battersea (where I was born and brought up) and Chelsea (across the river from Battersea and from where my interest in football was kindled). I haven't yet found a way of including Bromsgrove - not enough space in the shed! I'm very much of the view that "it's my railway and I'll run what I like on it" so there are all sorts of locos and rolling stock which will appear (much of it of Southern Region origin), a lot of which I have accummulated during the last few years whilst running the models business. I'm more into running trains rather than fine detailing models and scenery and I am finding the ability to carry out fine working more challenging as age progresses so most things will be RTR or off the shelf. 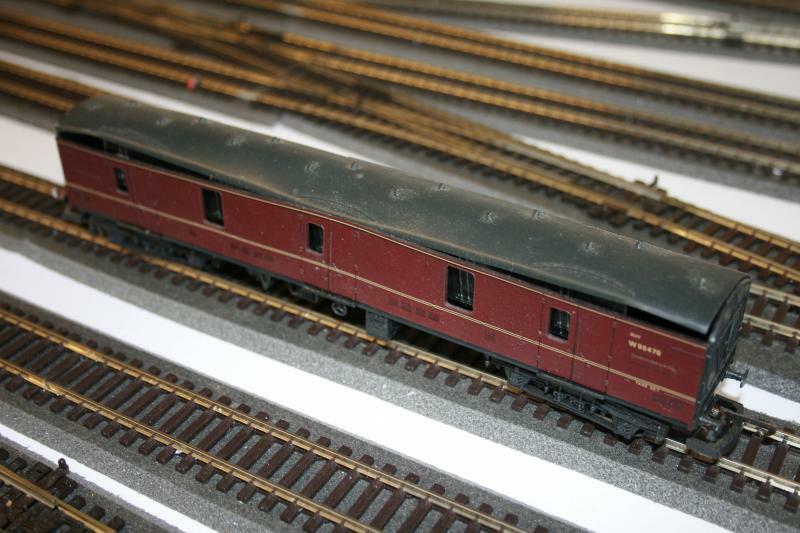 There will, however, be a number of US and Canadian items appearing - I have a cousin in Canada and was very impressed with the Canadian railways when over there and the quality of North American models, so have been collecting a number of examples of their locos and rolling stock. I'm not a fan of computer control though I am very much into DCC - for me a train needs to be controlled by a human being with enhanced control being provided by the additional features that digital control can provide. The layout will be divided into a number of blocks and points and signals will be controlled by DCC - hopefully all will be visible on a couple of mimic boards (when I've built them!!). Control will be provided by NCE DCC using the 5amp PowerPro system with a booster, a mixture of solenoid and slow-motion point motors, and block detection using Team Digital BlockD8 and NCE BD20 devices. 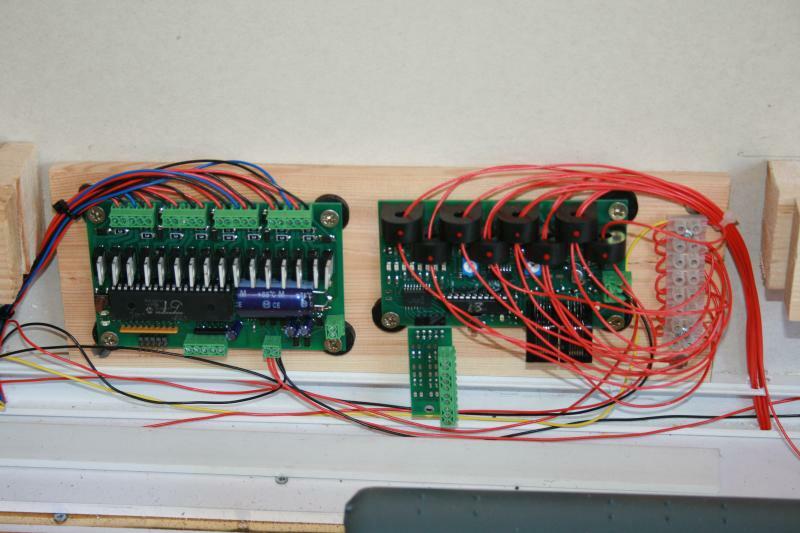 Solenoid and some slow motion point motors will be controlled by Team Digital SMD82 and SMD84 accessory decoders. Updates might be irregular, as time permits (and travels to France) but I wil try to provide some photos and plans in the next few days. Looking forward to this one, John! Love the place names. Pig Hill Yard - a small Inglenook shunting layout for my boys, in 00. Sounds great. Bring it on! Looking forward to this. Bring it on. Good luck with the layout John.Sounds like you've got your hands full. I'll let you off, Ed!! I remember going to Craven Cottage a couple of times - Johnny Haynes was a great player. The first £100.00 p/w player.I went to Craven Cottage once to see "the three v the six" which was a commemorative match played when Britain joined the common market with two other countries against the six already in it. Looking back it's a shame we played in it.Look at my username John and you'll see where my heart lies. 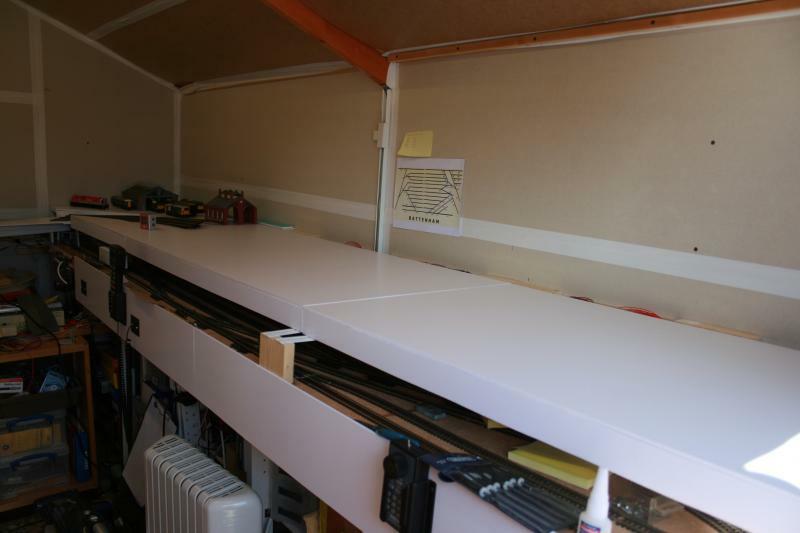 The layout, for the most part, is supported on kitchen cupboard carcases which are at the right height and provide a lot of storage (I need a lot of storage for all of the locos and stock I seem to have accumulated!). Although I had started the Chelford part of the layout a couple of years ago, having built the baseboards, I had never had the time to get much further and I'm finding it much more difficult to do physical construction tasks so in September 2013 I met a model maker (Dave Walton) who recommended the use of foamboard. Dave has been helping me (for a fee!) 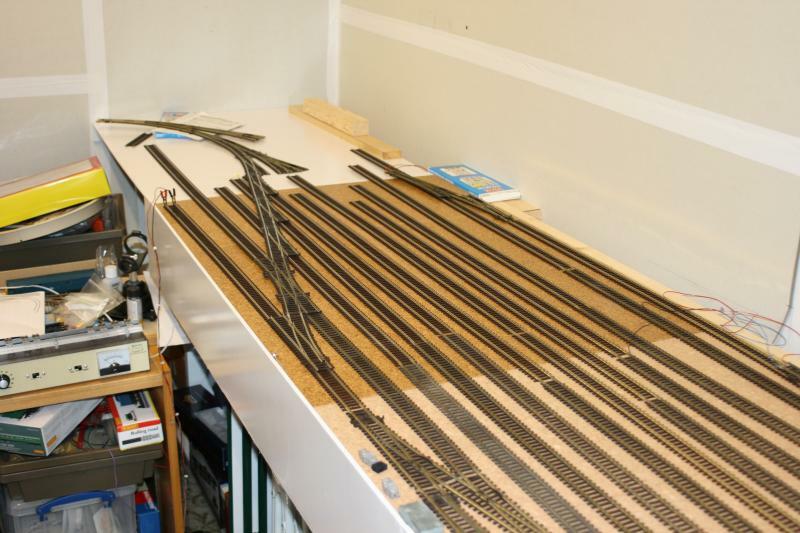 with the construction of the two levels of baseboard for the Battenham (lower level fiddle yard) and Oxsea (upper level terminus), the gradients and linking structures to join together the different elements. 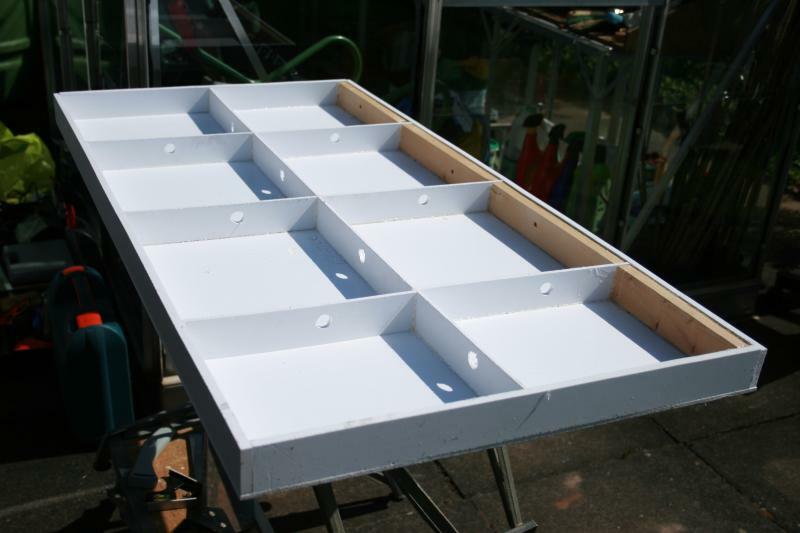 Foamboard has been very useful and is more flexible (in many ways) and generally lighter in weight than timber. Different thicknesses have been used - 3mm, 5mm and 10mm in order to provide the right amount of rigidity and flexibility where needed. It has been a few months since I last posted about this layout, so I thought that an update might be appropriate. I've been away in France a couple of times since April and have spent a fair amount of time working on the layout so the opportunities to update here have been rather limited. 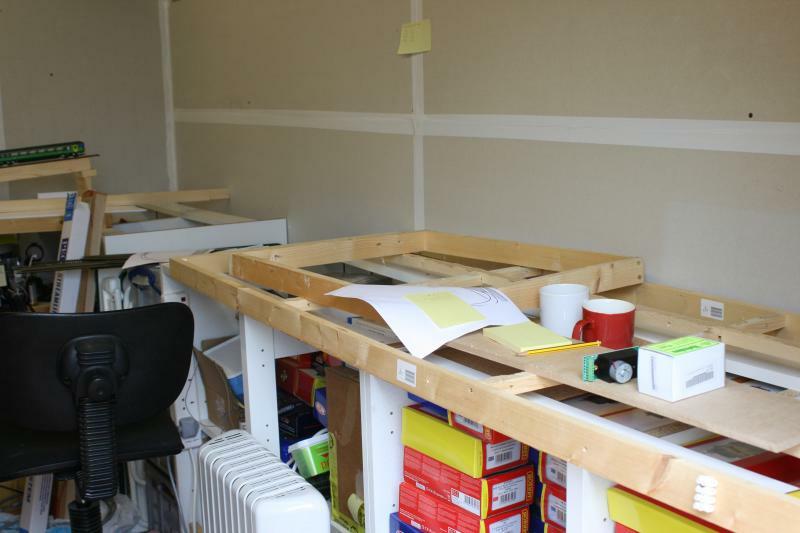 This was how the right-hand side of the shed looked before we started in August last year. We spent quite a bit of time experimenting with gradients that would work, enabling trains to move between the left hand part of the layout, the lower fiddle yard and the upper level. I used a little digital device I purchased some time ago from Micro Mark in the US to measure gradients and this proved extremely useful in a number of areas around the layout. The unit shown was used to test the gradients worked - interestingly the addition of weight to the non-powered car made a lot of difference. The photo above actually looks as though the gradient is more severe than it is, mainly because there is a downward slope of the lower board from left to right. Once we had got the eventual position of the gradient right we started to construct the supporting timbers for the lower level against the righthand wall of the shed. 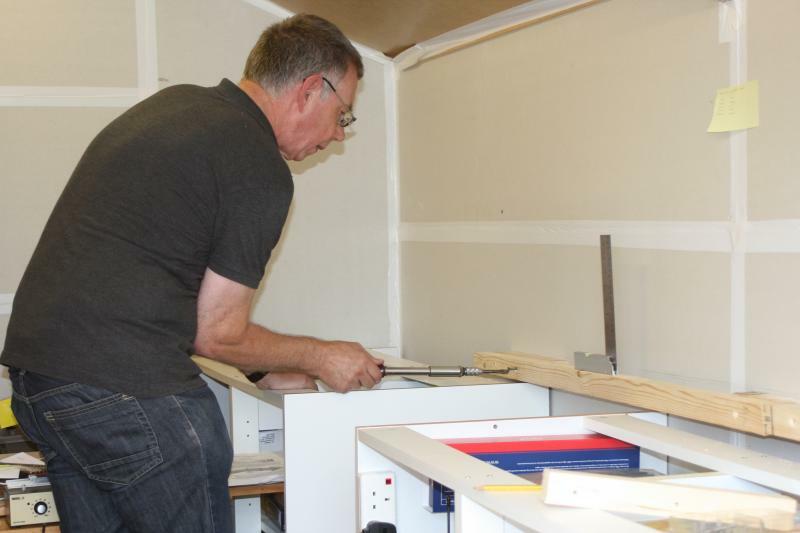 Dave then made up the foamboard baseboards to occupy the lower level. The plan was to have a deep front edge to allow for control panels to be inserted into it, whilst the back edge would be hinged on the timber support on the wall to allow the whole central part of the lower level to be lifted. More on this in the next post! A completed board is put into its approximate final position and levelled. Each board then had a long brass hinge attached to allow the board to be lifted once in position. 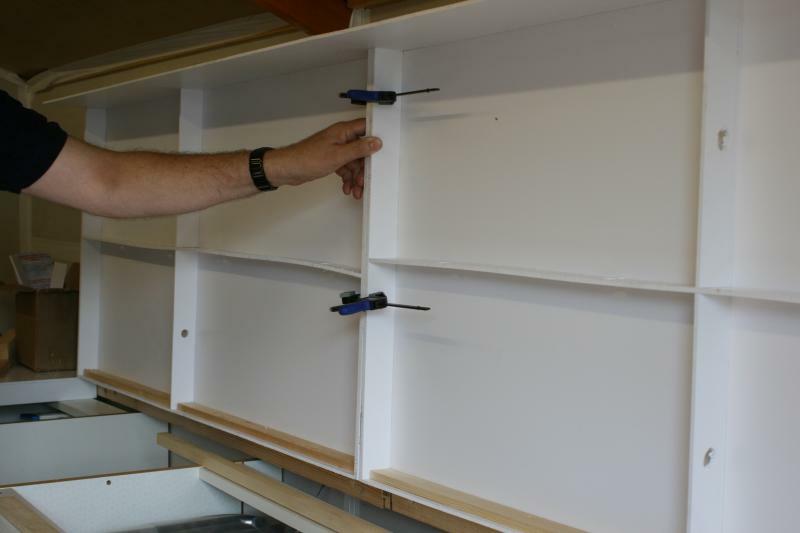 The two main boards of the lower level were then joined together and glued, being held in place by clamps whilst the superglue set and were also bolted together. The back edge of each board had timber support in order to reduce any potential distortion of the complete board when being lifted on the hinges. 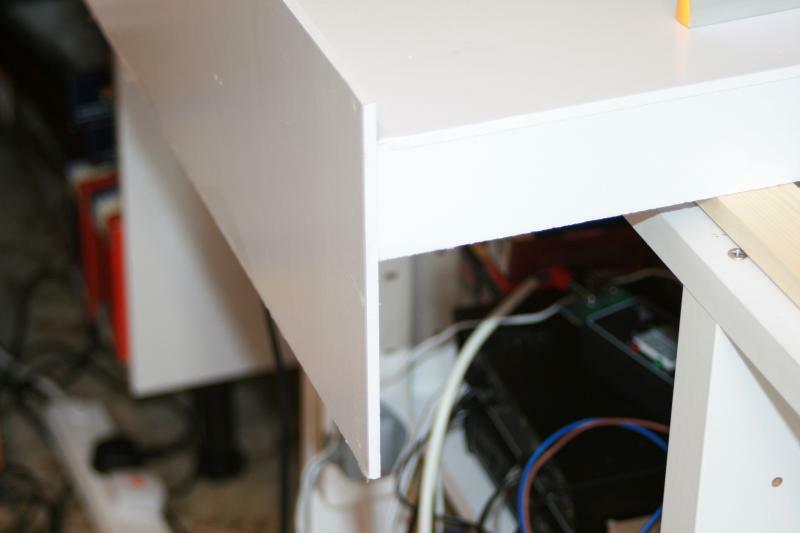 Holes were drilled through the supporting structure underneath to allow wiring to pass through the underside of the board. 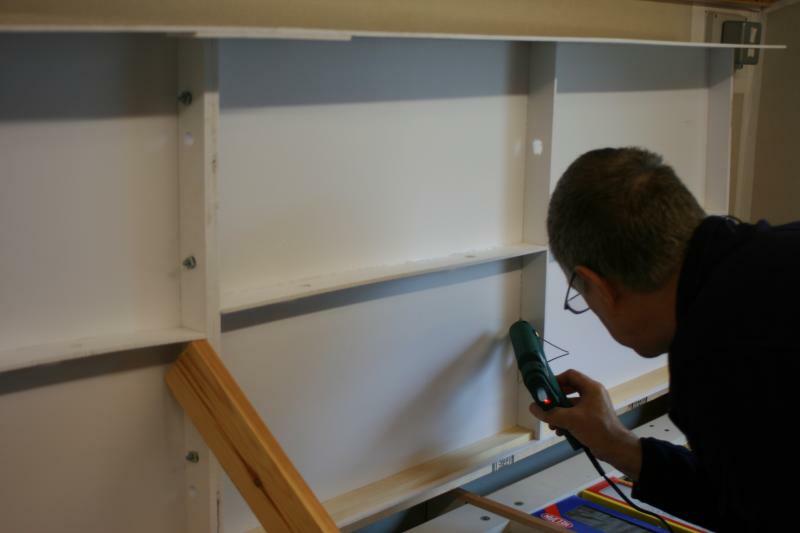 Dave then glue-gunned all of the joints to provide additional support to the superglue and improve rigidity. .....whilst on top the surface was covered in cork tiles and the start of the track layout begun (photos above and below). 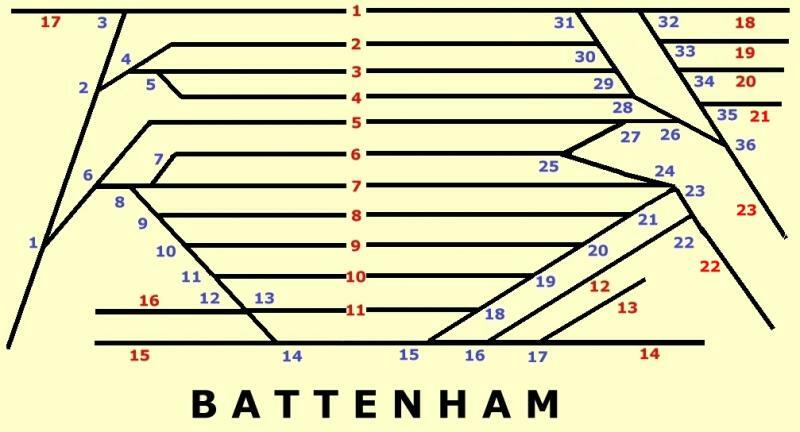 The final schematic for Battenham fiddle yard is shown above. Red numbers show the blocks and blue numbers relate to the points. The plan is to have a mimic board using this diagram with yellow LEDs being lit when a block is occupied and red/green LEDS indicating the direction each point is set. I already have the LEDs to enable this to happen but I'm rather torn over what to use as the material to use to mount the diagram. If anyone has some (sensible!) suggestions they would be much appreciated. I had envisaged the thickness of the material being not more than 3mm. Well, it appears that all the photos I took of progress from that in the last post to today have been wiped from the SD card in my camera!! I thought I had already copied them onto my computer, but alas I cannot find them! Before showing progress to date, a word of warning to anyone who has a layout exposed to direct sunlight. 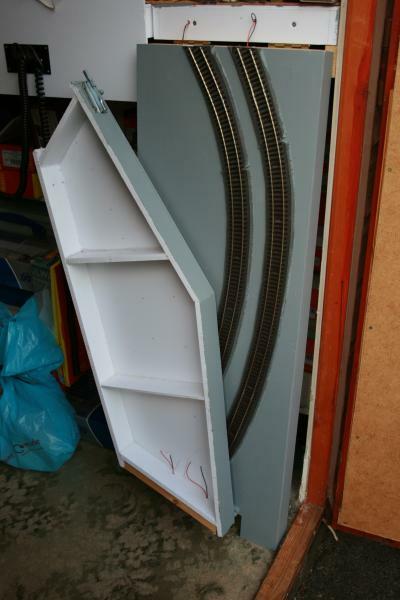 Many years ago, soon after the shed had been built and I had managed to create a small layout on the window side of the shed, I had left some of the stock I had on the track in front of the window. It hadn't occurred to me that sunlight would have such a dramatic effect. The damage shown in the photos above occurred over a few weeks when I couldn't get to the railway. I soon installed roller blinds which are now permanently closed! It does still get very hot in the shed during the summer (even with the door open). I fully insulated the shed several years ago and have a small heater in it which is left on frost-stat during the winter months (and turned up when I am in there!!) and also a dehumidifier which is on most of the time when I'm at home. One of the (numerous) problems to be overcome with the layout was how to bridge the doorway whilst still leaving access for humans and gardening equipment. The bridging area between Battenham and Chelford would also have a slight gradient as Chelford (on the window side of the shed) is at a slightly higher level. The answer was to have a folding section. The whole section is supported in the middle with two sturdy timber uprights close to the hinged folding point. 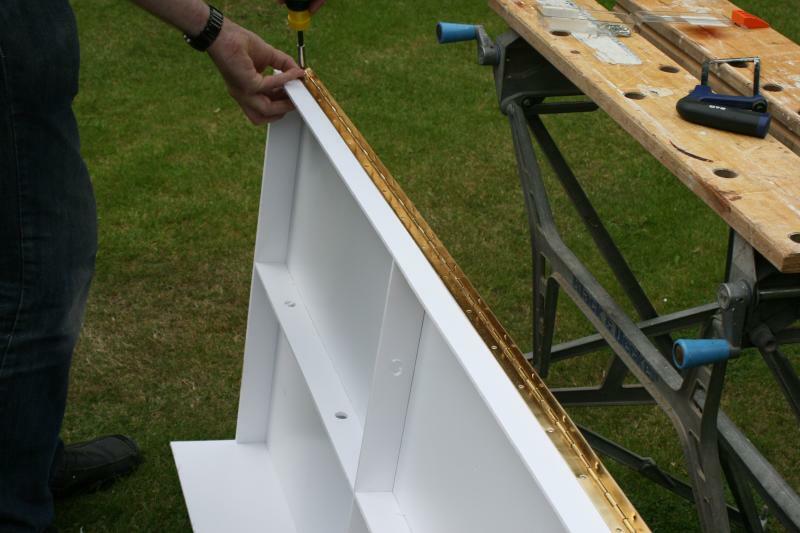 The Chelford end of the bridging section sits on a support on the end of the baseboard and is bolted into position, one each side, to ensure rigidity and correct alignment. Power is fed to the section from the Battenham side. 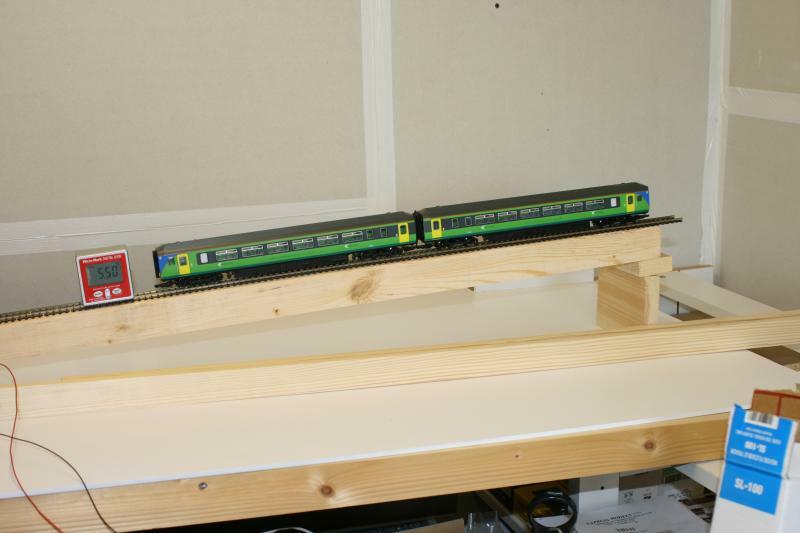 However, there was an issue which had to be resolved to avoid short circuits - when folded the tracks on the two sections come into contact, so if power is on to the rest of the layout a way had to be found to allow the layout to be used whilst the bridging section was down. The answer was to fit two on/off switches, one for each track. Unfortunately these were rather difficult to fit as they are on 10mm foamboard, hence the lack of alignment!! 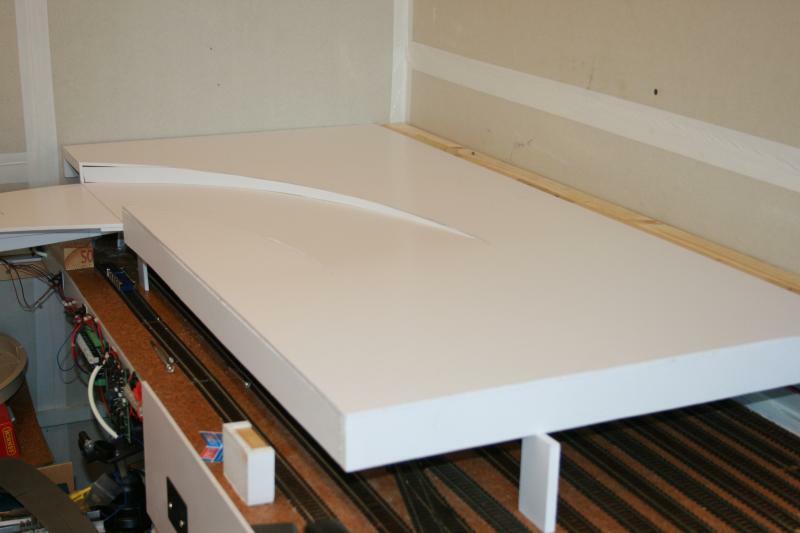 The track on the bridging section (as on all the exposed track on the layout) is laid on DCC Concepts foam underlay but hasn't yet been ballasted, though I have given the rest of the folding boards a coat of grey undercoat on the top surface. 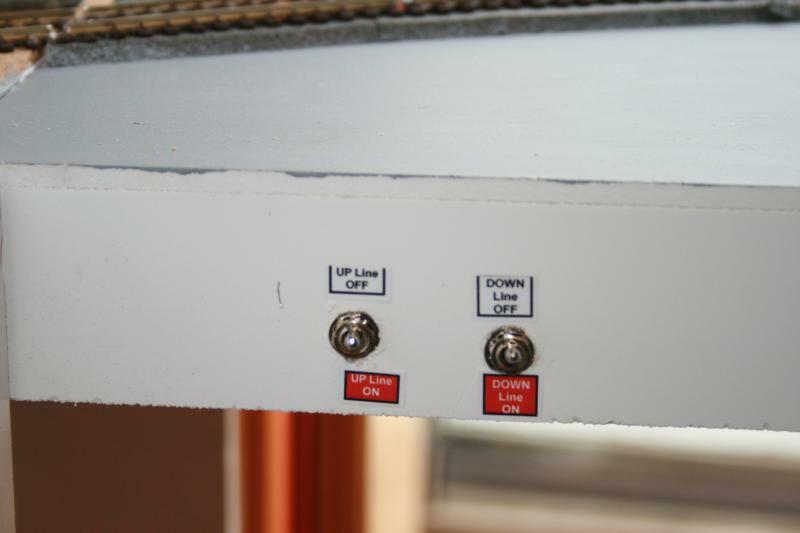 As I said in an earlier post the wide foamboard fascia provides a good surface in which to locate the NCE panels into which the throttles can be plugged, being connected together by cables which daisy-chain between the panels. I've also a few throttle pockets which are invaluable for locating the throttles. 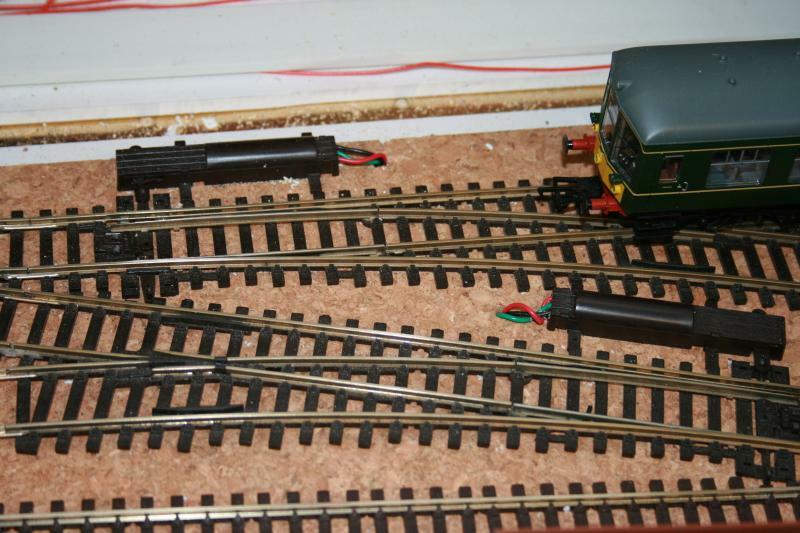 The Oxsea and Battenham side of the layout is protected by a PXS2, with one output going to Battenham and the other to Oxsea. 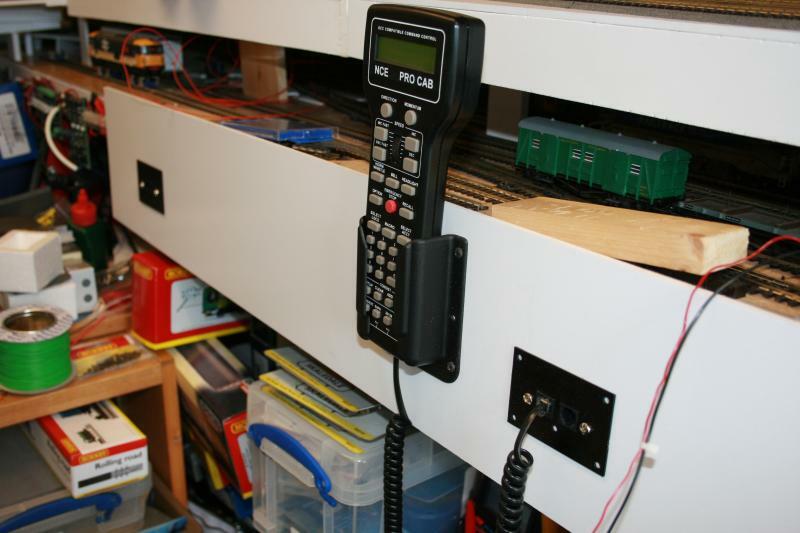 The Chelford side of the layout is protected by a PSX1. 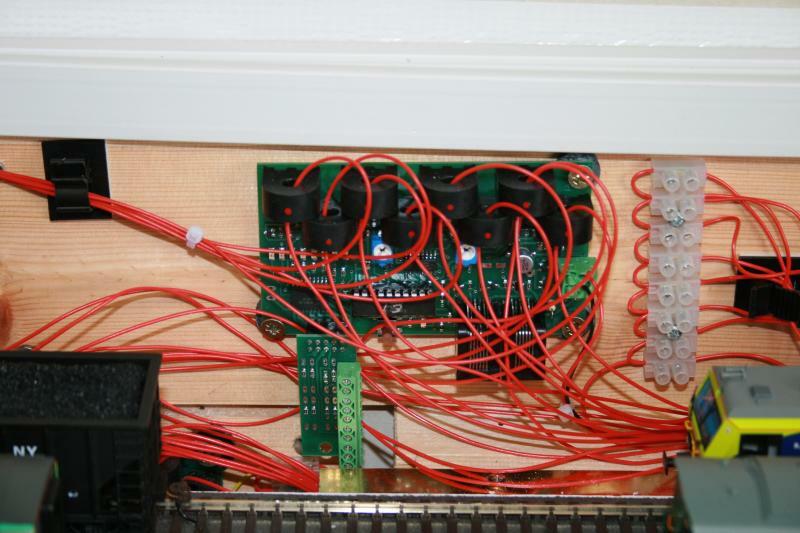 In addition each level has an additional circuit protector used to power accessories - the photo above shows a NCE EB1 which powers SMD84 accessory decoders, one of which (currently not connected up) is next to it. The SMD84s control Peco point motors, a mixture of PL10W low current motors and PL13 surface mount devices, as shown below on Battenham. You might notice that two wires go through some of the detectors. This is because some of the sections have been cut where the sections go across two boards so there is one wire from the same section on both boards (if that makes sense!). The small circuit board plugged into the bottom of the BlockD8 will provide outputs to the mimic board so that I can see more easily on the track plan where there is track occupancy. Wiring of the blocks has now been completed for both Oxsea and Battenham. 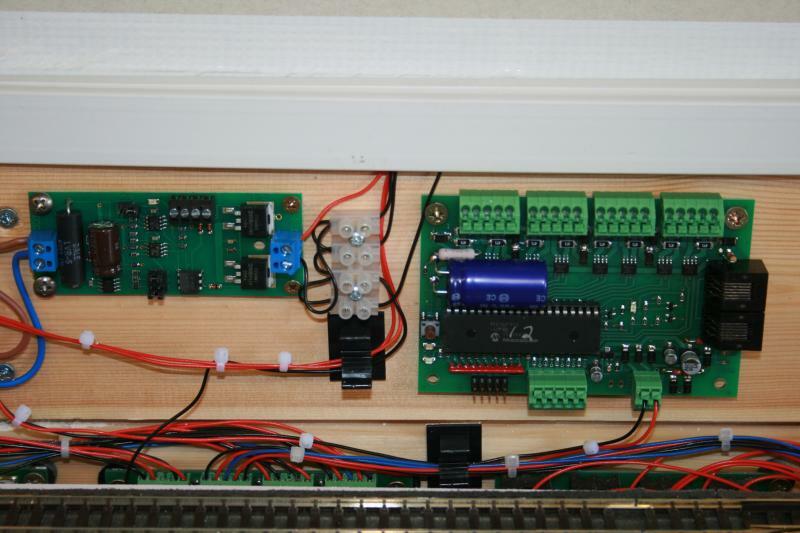 The photo above shows the centre board (of 3) of Oxsea where I have just started installing Traintronics point motors. The first Oxsea board (to the right in the photo) only has 5 points and I used a mixture of Peco and Seep motors here. Whilst wiring these up I discovered that it is possible to switch 2 Peco PL10W (low power) motors simultaneously from one SMD84 output on a crossover I have in the main station. One of the aims in controlling the layout was to be able to switch a number of points with one command, in order to create a route. This is especially important in the Battenham fiddle yard as it is out of sight. The NCE system allows a large number of routes to be created using their macros, a series of up to 10 commands which can be stored in each macro. Macros can be linked so that a very complex route can be set. There is one caveat to this, though - only the last instruction in the macro can be used to link to the next macro and the linked macro must already exist for the macro being constructed to work. I found it necessary to work backwards when actually creating the macros and to create a blank spreadsheet on which I could pencil in all of the switching necessary to create a route and then divide up the instructions into blocks of 9 (assuming there were more than 10 instructions necessary). I found the printed spreadsheet boxes invaluable for scribbling in (and often changing!) when trying to determine which way each point should be switched. Well I managed to find a couple of the photos I thought I had deleted from the SD card in my camera - just hidden at the end of the photos taken in New Zealand!! 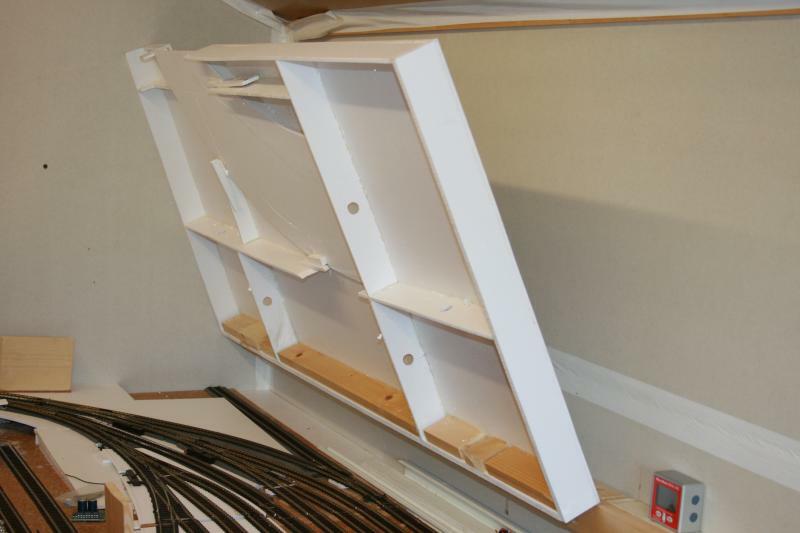 This photo shows the structure used to assemble each of the foamboard boards. 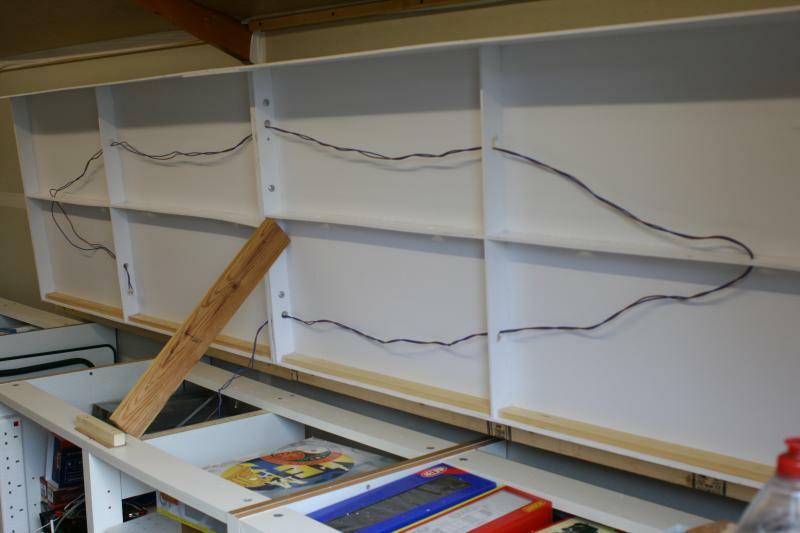 The wooden inserts were put into the back of each board to provide additional support and rigidity where the board is hinged against the backwall of the shed. On reflection I think a piece of timber would have been better down the centre of the board as this would have provided a little more support. The foamboard is quite flexible and does bend when there is a lot of weight on it. I'm also not sure how much the heat we have been experiencing during recent weeks has impacted on the lack of rigidity of the foamboard. 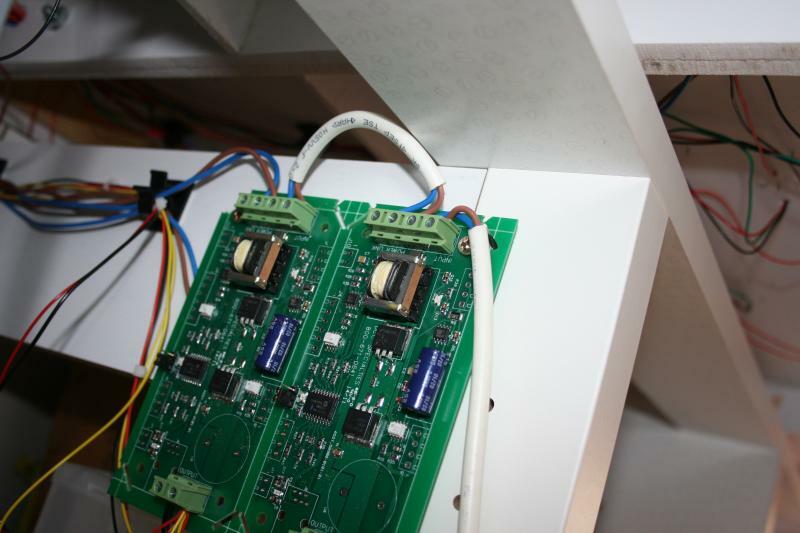 The photo above shows two of the boards being used to control and monitor the lower level - on the left is a Team Digital SMD82 which controls 8 of the Peco points on the lower level. 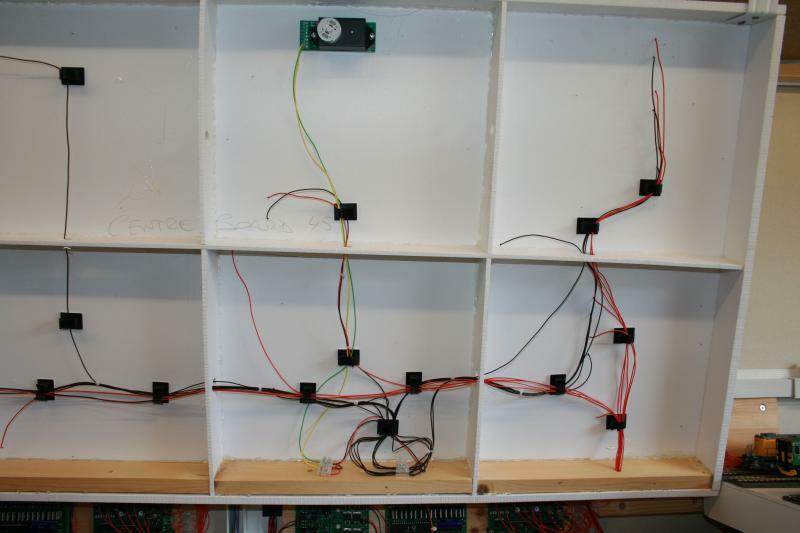 The board on on the right is the Team Digital BlockD8 which allows 8 tracks to be monitored for occupation. The small board which appears to be hanging downward from the BlockD8 provides links to LEDs on a mimic board, yet to be constructed and wired up! This was, perhaps, the most difficult board to construct as it has to lift and also link with the gradient from Chelford. 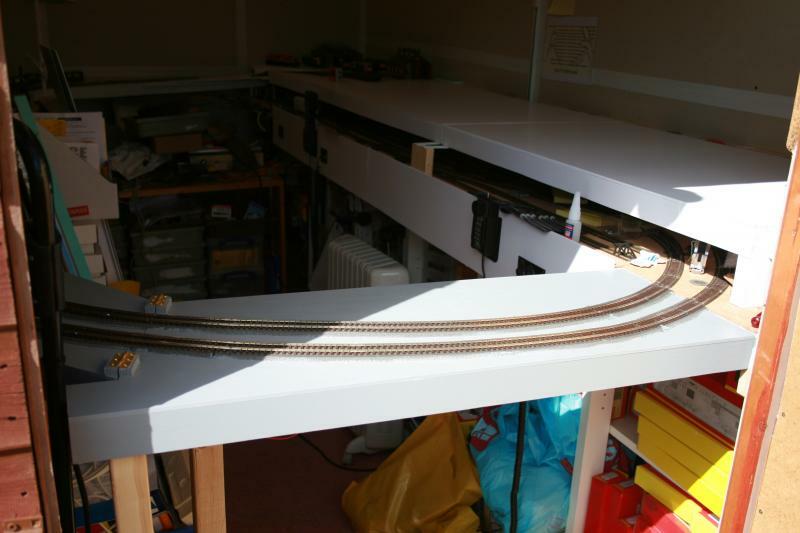 This view shows the two gradients at the far end of the layout, with one going downwards (at the back) to the fiddle yard (Battenham) and the other linking with Oxsea, to the right, on the upper level. This close-up of the end board shows the problems which had to be overcome, including allowing for a gradient which will link successfully with Chelford. 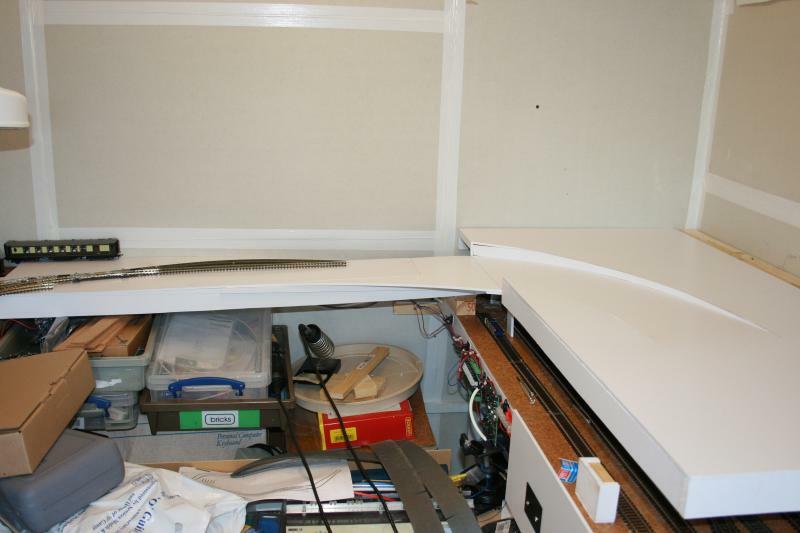 The gradient itselt has a break where the board lifts, but the gradient inbuilt into the board was relatively easy to do (once the curvature had been calculated) as the foamboard was just cut and its flexibility allowed movement of the cut section to the correct position. The photo above shows the completed upper level boards in position. Providing supports for the upper level was not straightforward as the fiddle yard tracks beneath are fairly close together so metal brackets and a piece of timber offcut had to be used to provide support where two of the boards meet at the front of the layout. 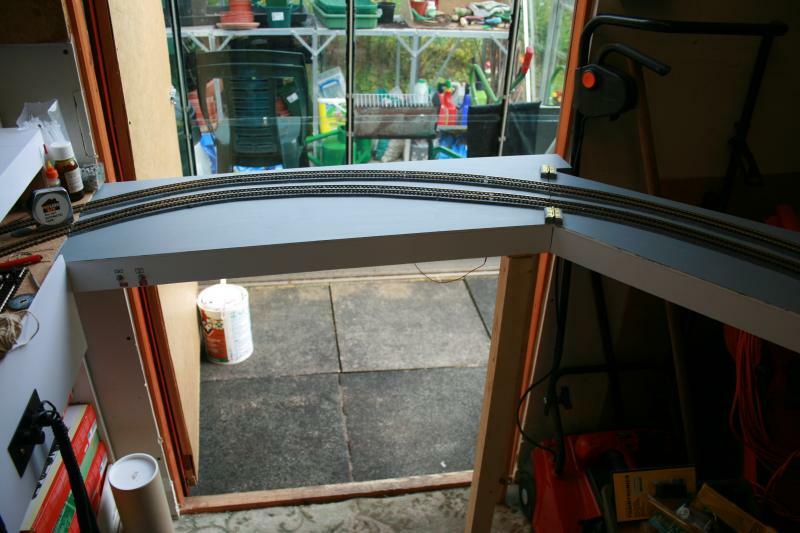 I have already provided photos of the bridging section of the layout at the door end of the shed but this is just a view of that section from outside the shed. This is looking fantastic, very neat wiring there. Thanks Jimmy. Wiring not as tidy as I'd like! There is a lot of it, though! !